My son, Monty, has autism as well as many other, co-morbid conditions. Co-morbidities are conditions which overlap with the ASD diagnosis; for example he has chronic anxiety, ADHD, Tics, Dyslexia and Dyspraxia. His anxiety was spiralling out of control and became very difficult to manage. As a counsellor myself, I felt dreadful being unable to help my own child. Taking the decision to medicate your child for conditions and disabilities that impact their daily lives can be really tough and is not for everyone. Particularly where they may perhaps be seen by others as ‘non -essential’ or ‘the easy way out’. But let me assure anyone reading this that choosing to use medication to help your child is anything BUT the easy way out. It is a decision that is usually reached when every other avenue has been ineffective. It is something I experienced recently at an appointment I was attending with Monty a few months back. Monty has been attending monthly Cognitive Behavioural Therapy (CBT) sessions for 18 months due to his chronic anxiety. It had become evident that he has been unable to adopt the strategies suggested by the psychologist because the anxiety was too powerful ‘in the moment’. It took away any of Monty’s ability to reason with himself or to be able to stop and take stock and think, ‘What is happening here?. He would immediately go into ‘meltdown/panic attack mode’ so the psychologist suggested that we might want to consider trying medication as it might enable Monty to access the therapy he was receiving without the anxiety taking over. As a result of that conversation and by our choice, at the next appointment we were joined by a consultant psychiatrist to explore administering medication for Monty’s escalating anxiety. It was a mutually appreciative conversation whereby the consultant explained to me about different medications and what they do and how they might help. I was already aware of many of them anyway, which, for me, did help. We then went through the potential side effects, what to do if we noticed any of those side effects and then any other questions I had. I then had the option to go home and discuss this with my husband and to get back in contact in a few days once I'd had the opportunity to process all of the information. I asked for an email contact and was provided with this, so if I had further questions I could send these in via email. 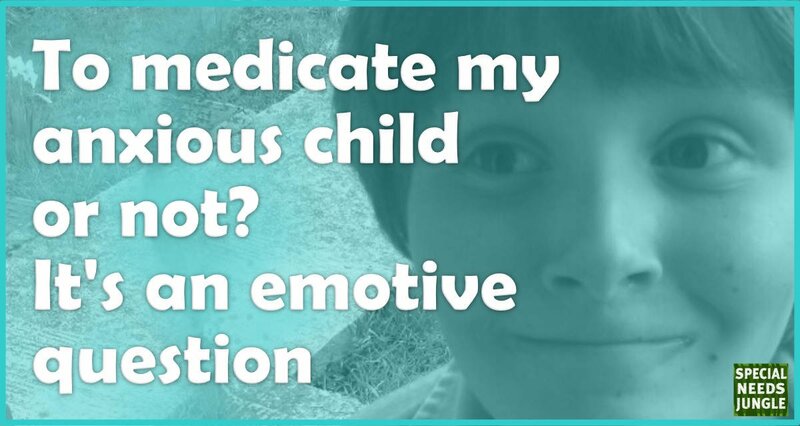 This was one of the most helpful things that was given to me as it gave me the opportunity to have a really good think and it suggested to me that what I thought and felt about administering medication to my son really mattered. I felt 'heard' and it is this that I believe is often the most important part of any communication we have with someone where there is an imbalance of power. Let’s face it, there is usually a power imbalance with any professional who has involvement with our children’s health or education. It can leave us parents at an emotional disadvantage. It is the role of the professional to ensure that this is not evident in any conversation they have with us. Even when there are potentially difficult conversations to be had, that imbalance must not become evident because it is at that point the relationship has the potential to break down completely. It is the role of the parent/caregiver to ensure that they listen to the professional and try to remain, where possible, calm and open minded. Fear, guilt and shame are often huge emotional barriers that can that can be a decision maker or a breaker, especially where our children are concerned. I know I was cautious about beginning meds, partly because of what I had read in the media, partly because I didn’t want others to know we had started meds, but mainly because I felt fearful and guilty. Fearful because I didn’t know what impact the meds would have and guilty because I felt I had failed as his mum. I felt I should have been able to continue and ‘made’ the strategies work. But I am one person, and I know how I feel is not a true reflection on what was going on for Monty. I could have continued thinking that way but then the decision would be based on what my thoughts, feeling and needs were and would become about me and not about what Monty needed. I reminded myself that this was about him, not me. What was important was that I was able to acknowledge my feelings but not be driven by them. I talked about feeling guilty and I talked about feeling afraid. After a few days, and it was so important to give ourselves time, I emailed the consultant with a couple more questions about long-term impact or stopping due to side effects and was answered in a way that felt I could trust the knowledge this doctor was imparting. We decided on a trial of Sertraline. The trial lasted a few weeks, but Monty became disinhibited in his behaviour and seemed to regress, despite the low dose, so this was gradually stopped. Following more discussion, we commenced a very low dose of Aripiprazole. This has been really helpful for Monty and has given him a an opportunity to stop and think before the anxiety becomes all-consuming. I think what is most important for us to remember is that this medication is not forever. We can stop it at any point or try another if it becomes ineffective. We can have a period without them to see if Monty has adapted without the need to restart meds and it is a choice we have rather than something that we feel we have to do. Having the choice and control was imperative if this was going to work and the doctors we have been seeing have been nothing but thoughtful, helpful and totally professional. Make sure you feel comfortable and that you feel a part of the process in decisions about medication. Ask as many questions as you need to, a good doctor will be happy to answer you. Take your time. Don’t feel rushed, if you know the appointment is coming to an end and you still have unanswered questions, or feel unsure. Just be sure to get a contact email so you can get in touch to ask further questions. Manage your own feelings and expectations – talk to people whose opinion you trust and value. Remember that rarely is anxiety/depression medication in children forever. It might be that meds are used for a short period of time. This might be enough for your child feel less anxious and cope better. As I found out, there is very little available online to help with medicating a child. Many drugs are unlicensed for children, as who would put a child forward for a clinical trial (A GP once told me this when I was asking questions about whether to medicate or not) and of course that makes complete sense. Always remember that it will be a personal choice and not one to be taken when feeling under pressure from anyone. It’s so hard to get any kind of help or medication for a child without CAMHS involvement in my experience. My daughter is almost 18 now & has battled anxiety forever, as have I, but funnily enough I only recently figured out what it actually was. Things came to a head last year when my A* student was suffering such severe anxiety it threatened her ability to perform. For years I’d tried to get her to agree to see CAMHS for a possible social communication disorder assessment, (her sister is diagnosed ASD) but they were always met with refusal so we stumbled along. Finally at 16 I got her to the GP who refused to refer to CAMHS but referred her for counselling & decided to try her on Propanalol beta blockers for her very clear anxiety. They’ve been a bit hit & miss in all honesty, but we got her through last year. Forward on a year & A level final exams are looming, same problem. Counsellor suggested a possible social communication disorder & wrote to the GP, who finally referred to CAMHS who have agreed to do an assessment despite the fact she’s 18 in a few weeks. Personally I’d like her to trial other meds, but as yet no offer has been forthcoming so ill continue pulling teeth! Sounds like a difficult journey you have both been on – As she is 18 in a few weeks it might be that you and she feel able to revisit the GP and discuss options re meds with them. The options are usually greater for an adult as many drugs are licensed for adults. Try to ensure your see a GP your daughter and you feel comfortable visiting – Would your daughter feel more comfortable visiting on her own? Some young people open up more on their own. I wish you well. Thanks Angela. That has been the issue partly with her being under 18 tbh. I will have to try & persuade her to come back to the doctors again in a few weeks. Trouble is our surgery is truly terrible & the one GP she saw initially last year that she felt comfortable with was a locum who is no longer there, so getting M to go back again could be a challenge. The surgery is supposed to be closing at the end if September so we can then join a new surgery which hopefully will be better than this one. Exams are looming next month though unfortunately.